Mini RC Toys - What are My Choices? [caption id="attachment_161" align="alignleft" width="300" caption="Mini RC Helicopter"] [/caption] Mini RC toys are popular today with both kids and adults. These RC toys work on the principle of radio frequencies transmitting signals. What this means is that the toy is fitted with a built-in receiver to pick up command signals from the radio transmitter on the controller. When selecting a mini RC toy for a child, be sure to choose one which will not only provide them with hours of fun, but will also be educational in nature - thus teaching the child more about technology and its applications. Mini remote control toys take the form of remote control vehicles such as boats, helicopters, water cannons, aircraft and robots. Below is a look at some of the popular mini RC toys currently available on the market. Mini remote control vehicles include remote control cars, battle tanks, trucks and sports cars. 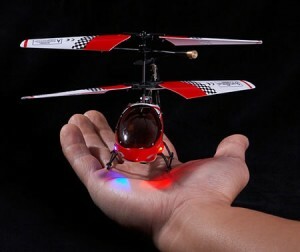 These are the most popular of the mini RC toys and are usually available as ready to run toys. Mini remote control boats include remote control boats, hovercrafts and speedboats in realistic miniature models which offer great fun to RC enthusiasts. Mini RC helicopters are currently very popular and are available in scale versions which provide a lot of fun and entertainment to both adults and kids. Mini RC aircraft range anywhere between the basic RC toy planes to the more complicated RC model aircrafts. When selecting your mini RC toys, you may also choose between the wireless mini remote control toys and the wired mini remote control toys. Wireless remote control toys are also referred to as the radio controlled toys which are a sub-type of the remote control toys. On the other hand, wired remote control toys are rare and not as popular as the former. This explains why the terms "remote control" and "radio control" are often used interchangeably.